Forgive the Lady of the Manners if this post seems a little scattered, Snarklings. The trip to San Diego Comic-Con was amazing, but just the teensiest bit overwhelming. But oh yes, the Lady of the Manners wants to go back next year. Be sure to scamper over to the Lip Service Webzine to read the book tour diary installment about all the hijinks! Thank you to all of you Snarklings who came to the Gothic Charm School autograph session or who recognized the Lady of the Manners in the Exhibit Hall and said hi! Meeting the people who read Gothic Charm School has been the best thing about the book tour. The Lady of the Manners wishes that she were able to visit more cities and meet more of you, but alas, a book tour budget only stretches so far. Speaking of the book tour: the next stop for Gothic Charm School is Powell’s Books in Portland, OR, on Thursday, July 30th at 7:30 PM! Yes, the Lady of the Manners is going to brave the sweltering temperatures Portland has been experiencing (though Seattle hasn’t been much better), and visit one of her favorite bookstores. 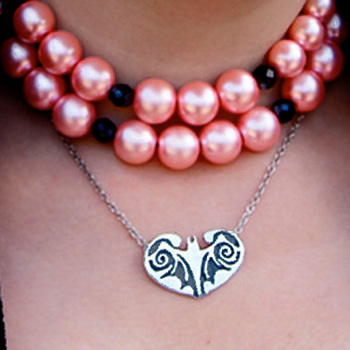 The Gothic Charm School Batty Heart necklace from Rocklove Jewelry! A sterling silver pendant that will add a note of Gothic Charm School whimsy and elegance to any outfit. $40. Gothic Charm School Body Butter from Starborn Alchemy! It smells like chocolate cupcakes (of course), and is available with or without pink sparkles. (The Lady of the Manners adores the pink sparkly version, but understands that there are Snarklings who may not be as fond of pink or shimmer as she is.) $7 for 1 oz. Follow the handy clicky-links to visit the stores of Rocklove and Starborn Alchemy to purchase the items! You see, Snarklings, there are events (such as San Diego Comic-Con), where if you’re not wearing jeans and a t-shirt, everyone is going to assume you are Dressed Up As A Character. Now, the Lady of the Manners understands how vexing that can be, really she does! She spent the entire weekend at San Diego Comic-Con smiling at people who would compliment her on her “wonderful costume”. (Apparently if you are wearing a top hat and carrying a fanged stuffed bunny, you are dressed as the Mad Hatter with the March Hare. The Lady of the Manners and Clovis the Devilbunny were quite amused by this assumption.) But the Lady of the Manners knew that trying to explain to the random convention attendee that no, really, she looked like this all the time just wasn’t worth the time or effort. Because at a big, chaotic event like a convention, the people complimenting you on your “costume” are giving you a slightly mistaken but genuine compliment in an Exhibit Hall where hundreds of people are in elaborate, and sometimes not instantly recognizable, costumes. The time and effort people put into their costumes for events such as San Diego Comic-Con is amazing and well-worthy of praise, so to receive compliments on one’s “everyday” wear in such an environment is very flattering. However, recognizing that the explanation of not being in costume may not be worth the effort at an event like San Diego Comic-Con is very different than giving up all notions of personal space. Just because you are wandering around a large event does not mean that you have to put up with strangers touching you. Being dressed up at that sort of event does not mean that you are public property, and that people should feel free to start grabbing at you or your clothing. The Lady of the Manners had to take a few steps back and say “Please don’t touch me” a few different times during her roaming around San Diego Comic-Con. Don’t be afraid to say this, and don’t be afraid to remove people’s hands from your person. As much as the Lady of the Manners would like to assume that people would know not to start grabbing at complete strangers, something about large events such as San Diego Comic-Con seems to drive those sorts of basic rules right out of people’s minds. With that reminder, the Lady of the Manners is going to go start planning her packing list for the sweltering heat of Portland, Oregon, and perhaps have a bowl of ice cream. As always, Snarklings, feel free to write to Gothic Charm School!